IT’S HERE! 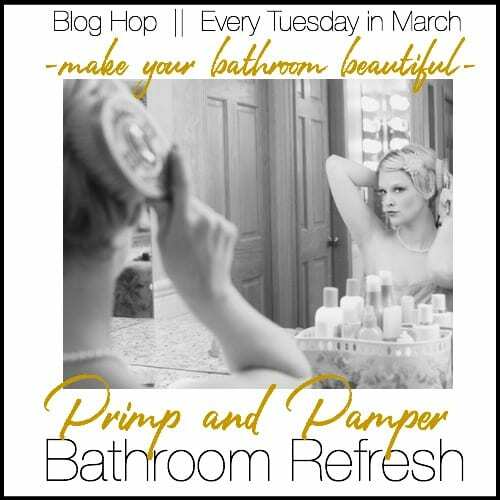 The Bathroom Primp and Pamper Blog Hop BIG REVEAL DAY is finally HERE!!!! 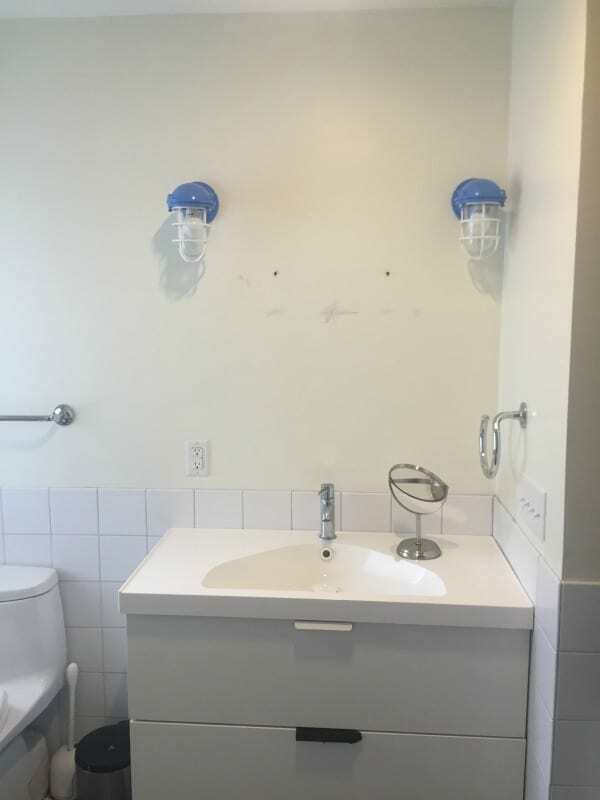 Come see my first of two bathrooms and then enjoy a dozen other beautiful bathroom make-overs. IT’S SO ADDICTIVE!!! 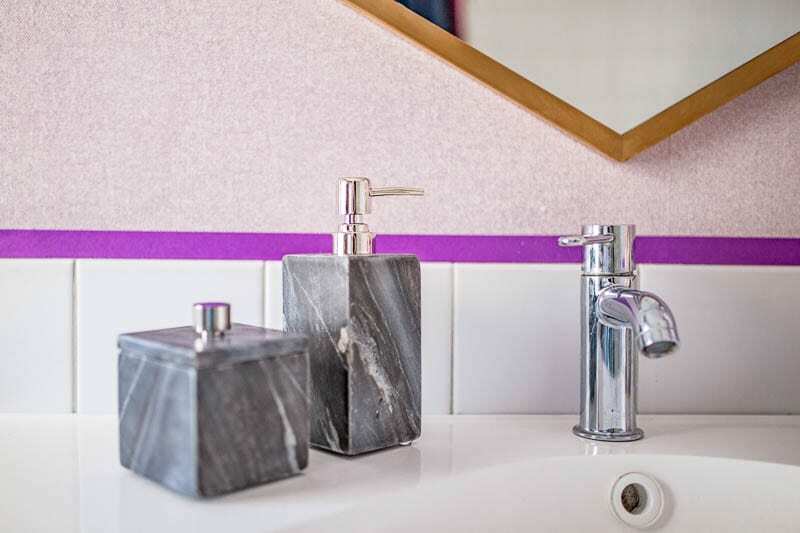 Thank you for bopping in to see my sophisticated, gathered, glam, eclectic lavender bathroom. Phew…Say that 10 times really fast. It was down to the wire on this one. My dear friened and talented photographer, Amy Greene (IG Handle: @contactamygphotography) and I were staging and snapping pics up until yesterday afternoon, but I’d say she completely out did herself yet again. 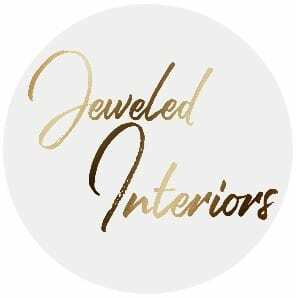 If you are new to Jeweled Interiors then you should know that we are a military family of 6 currently living in a New England 10 month rental. Yes, this may only be our home is for this school year, but I have a goal of finishing it before we make our 13th move 😱 this summer!!! Come on, you know you want to follow us on this crazy adventure 🙃. If you are interested in the other 7 rooms feel free to come check them out HERE after the blog hop. 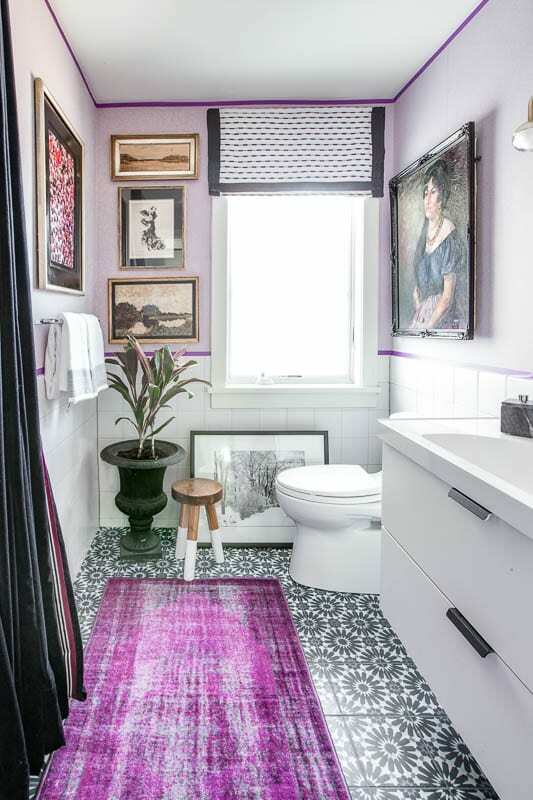 Ok, on the the room at hand and the bathroom that might make you actually like purple. 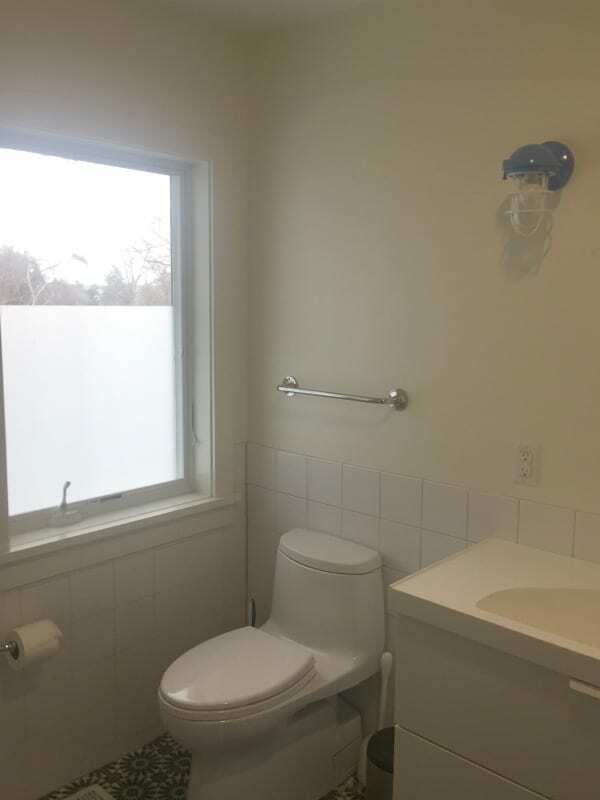 This bathroom probably gets the most use of the four in our home. It has a few nice features. Since this house was remodeled 16 months ago all of the fixtures and finishes are new. 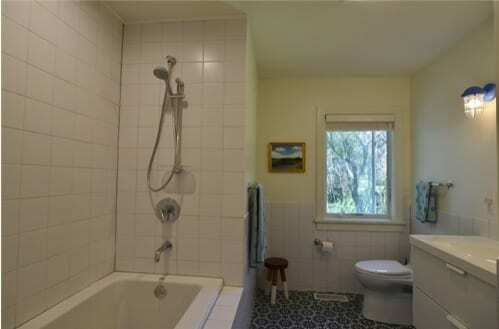 You can see that it wasn’t a bad bathroom at all. It just needed a little style. 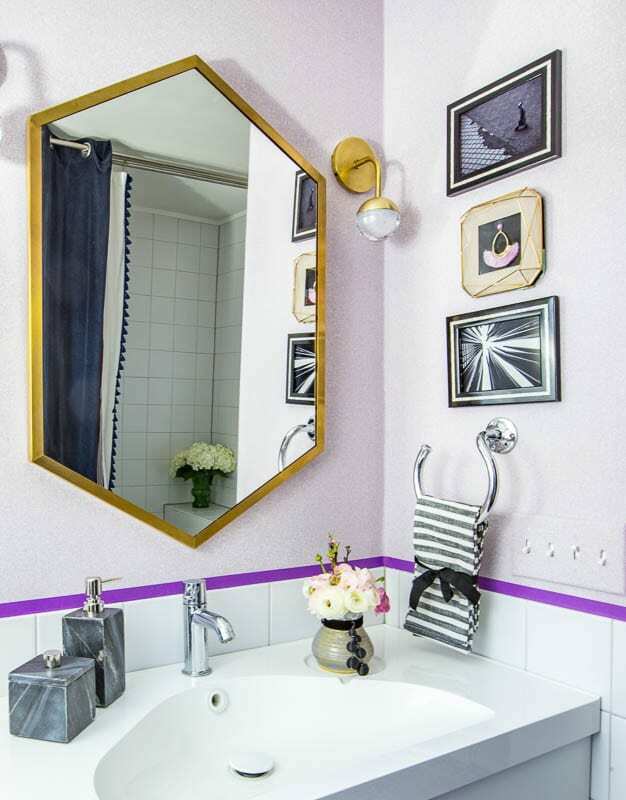 Two of the bedrooms near this bathroom have lavender wallpaper (Tween Girls’ Bedroom and Master Bedroom). It just made sense in my mide to keep this space cohesive. Mix in a little bit of antique and vintage art, a pretty rug, and stunning lighting…and…. 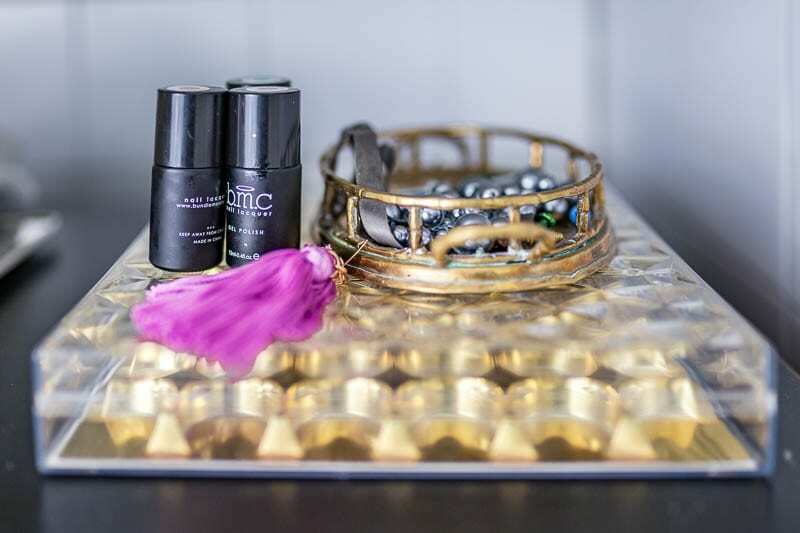 Ready…. drum roll…. What do you think? Better, eh? Now let me walk you through how I got the look. 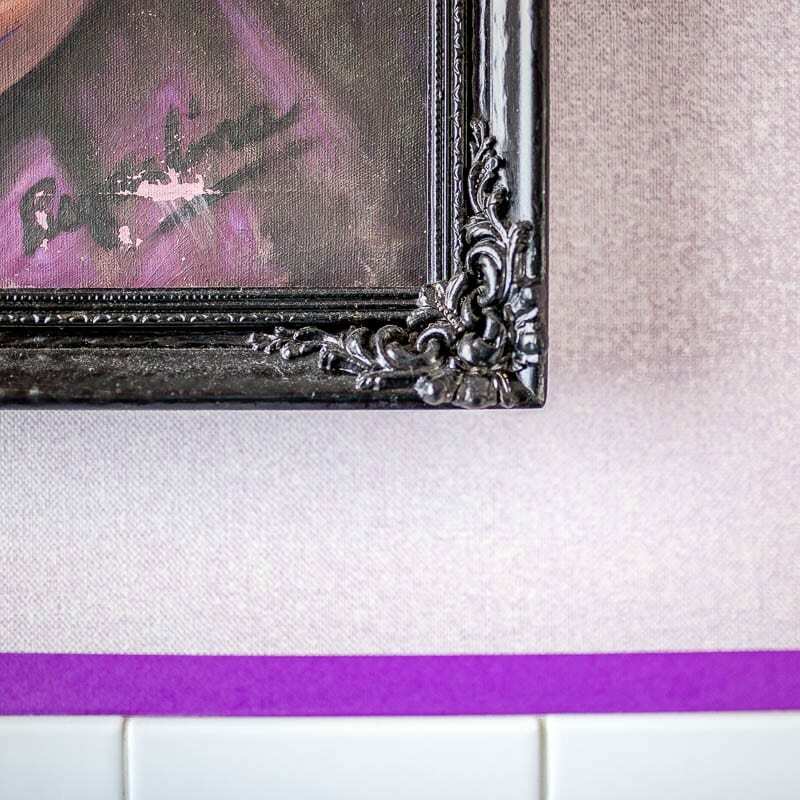 I considered using a paintable wallpaper but I’m so incredibly glad that I went with this Iona Woven Textured Wallpaper from Wallpaper Boulevard. It is just the perfect amount of color and the texture makes the walls feel so lux. If the owner of this home is reading the post, I have great news! It comes right down with a little water. You will never know it was here…except that it’s on the internet for all to see 😜. So, call me crazy, but I have this thing for velvet. Winter, spring, summer, fall…I just like velvet. Don’t be judgey. It’s pretty. 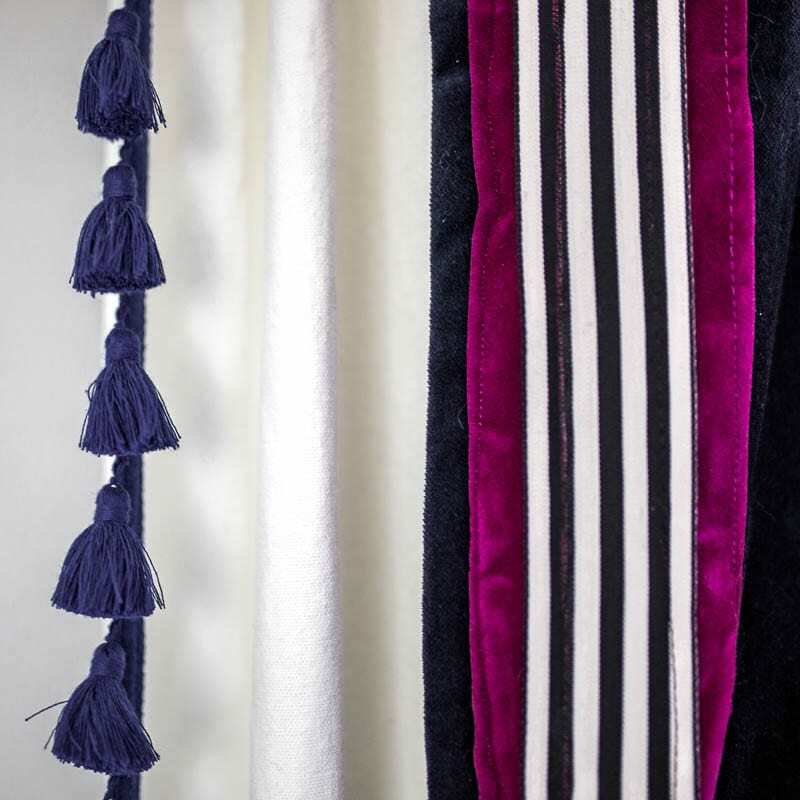 To curb my velvet addiction I picked up a pair of Ikea curtains and sewed some velvet trim (I bought at a thrift store for a couple of bucks) and striped ribbon. 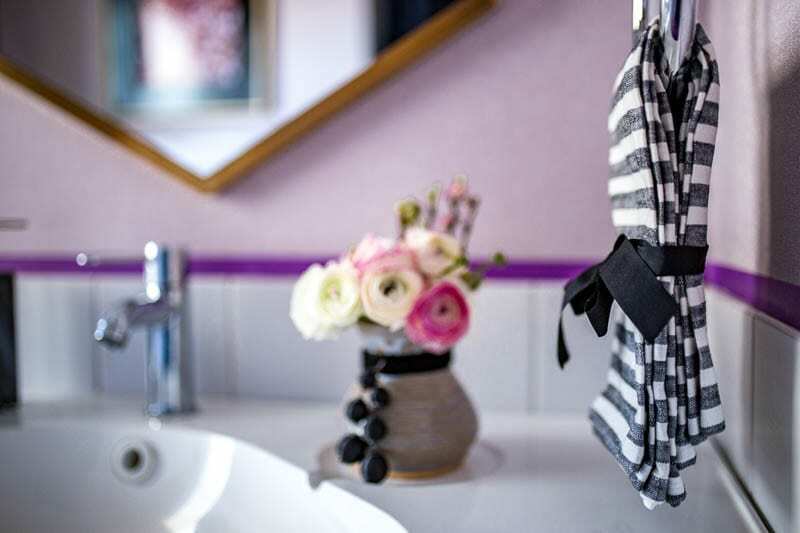 Truthfully the velvet is more for decoration than anything and I would recommend a lighter weight shower curtain to attach to your liner. This tasseled linen shower curtain is from Serena and Lily and luckily came with the rental. YESSSS! One of my favorite parts of the room is the Windsor Printed Overydyed Grove Rug from Rugs USA? That punch of violet rocks my world. Plus, its a simple enough design that it works with my lovely (though busy) tile. 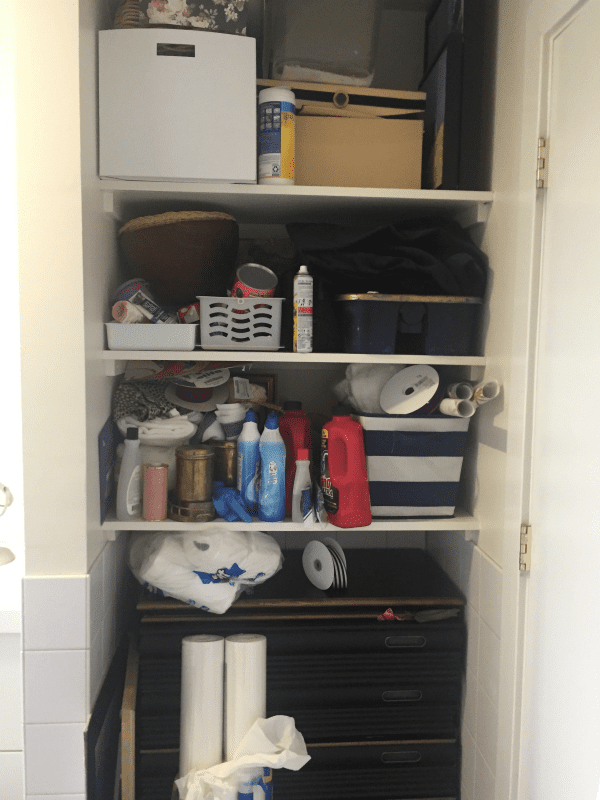 Last week I reported how I did the dirty work of sorting and organizing this scary open shelving area. SEE HERE. 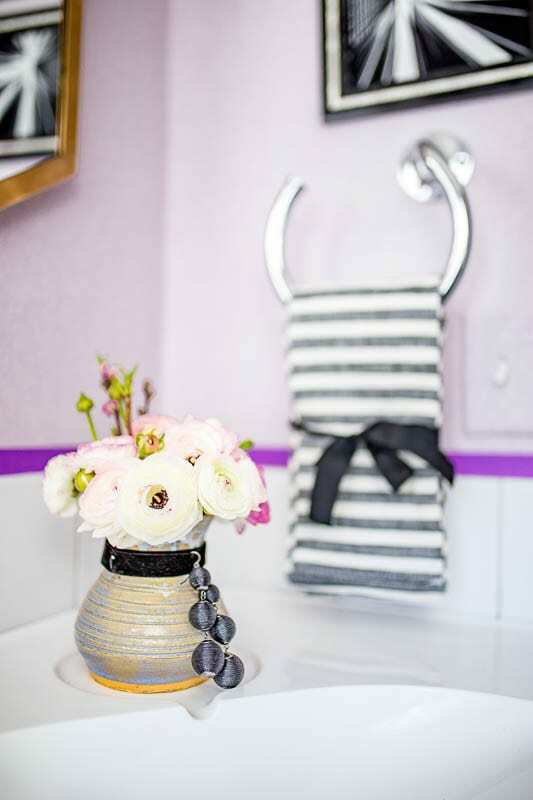 Over the last 5 days I added a little more pazzazz with pops of purple grounded by black and white accents and boxes lined with pretty paper. 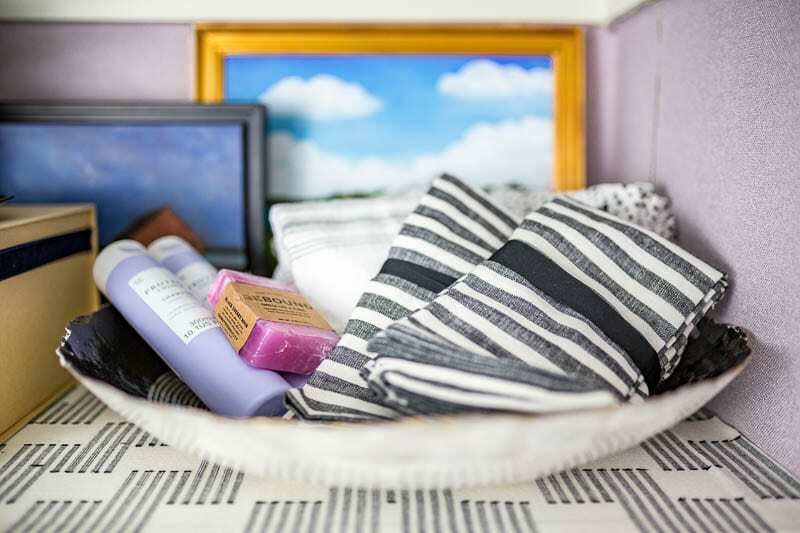 One trick to styling a shelf or built-in is to have repeating themes and colors. 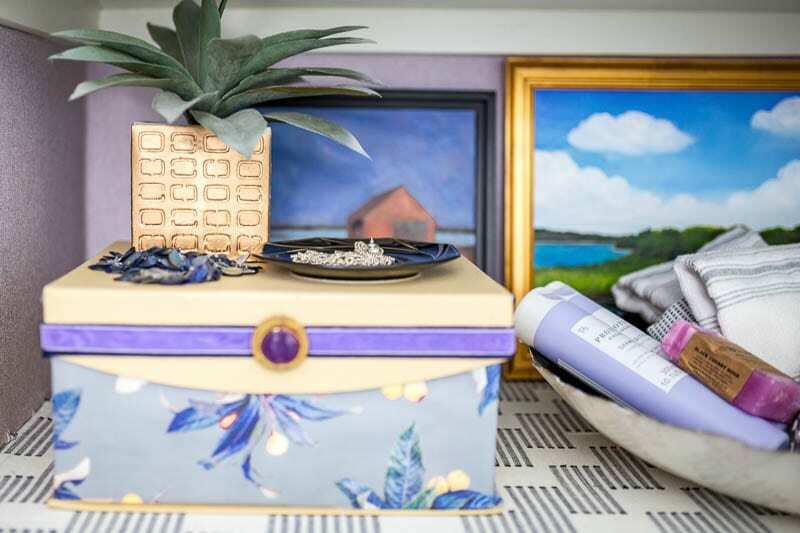 See above how I wrapped an item on each of the three shelves with the same pretty paper? That makes for instant cohesion. My husband bought home this amethyst necklace for me on a trip to Jordan. I’d say he did a pretty great job on this birthday gift, wouldn’t you? 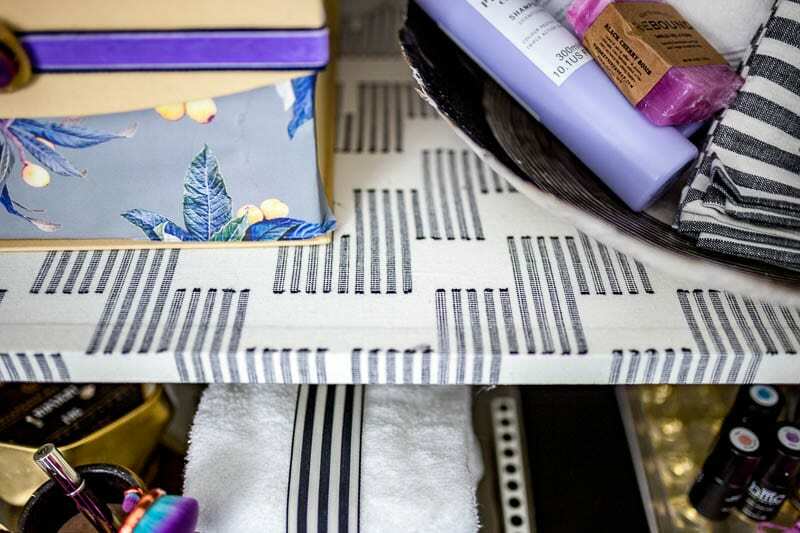 I think I earn bonus points for cutting up a Target shower curtain and applying it to the shelves with liquid starch…a pinterest project that I have been curious about for years. It totally works and you’d better believe you’ll see me use this again someday. 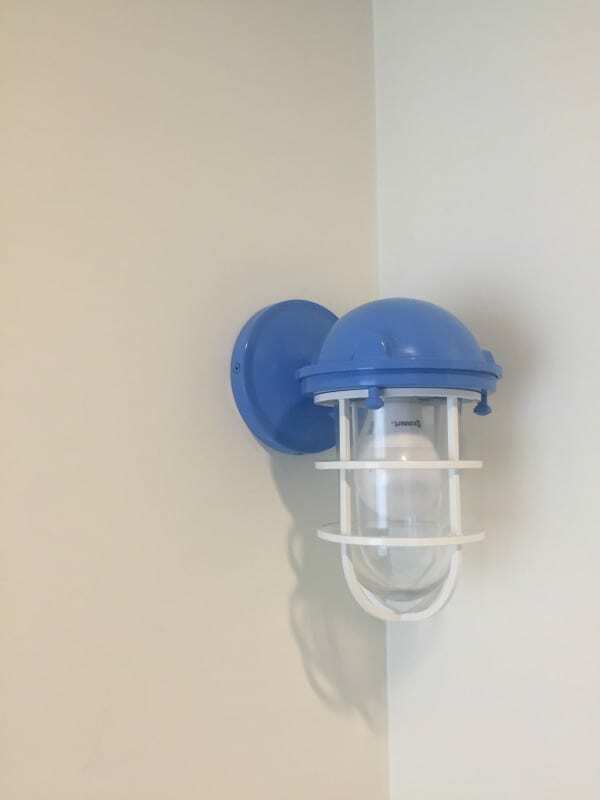 I just adore these Hudson Valley Boca 9 1/2 inch Wall Sconces from Lamps Plus. Aren’t they just the COOLEST? 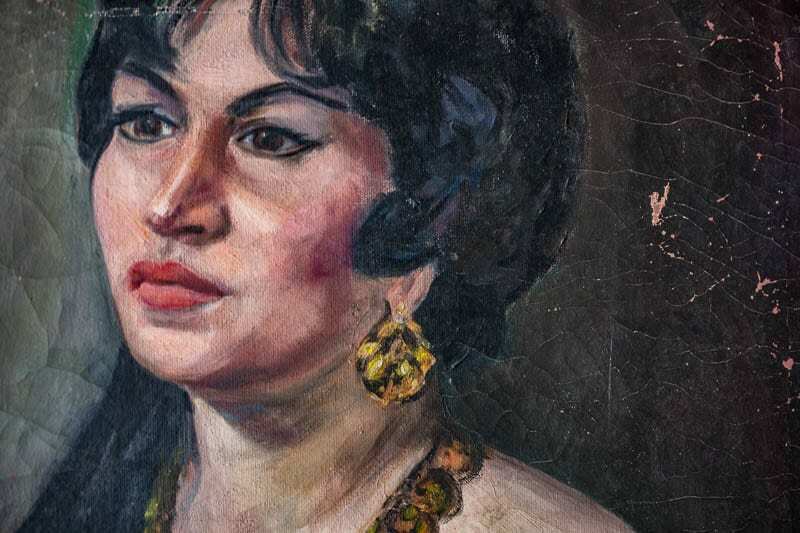 I am starting to think the best way to describe my style is “glam with a heavy dose of soul.” A sure fire way to deliver this character in a room is with vintage and antique pieces. In this case I used old art…enter our new friend, Carol. Hi Carol! Carol is raw and untouched and we are so excited that she entered our family for the low price of $5 during a somewhat suspicious Craigslist deal. I didn’t stick around to ask any questions from the man selling her to me, but we love the sass that Miss Carol brings to this bathroom. 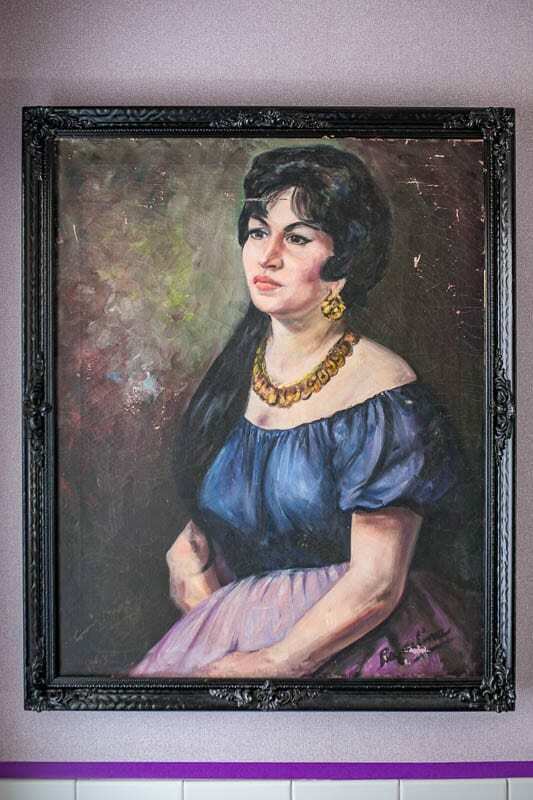 I purchased the three pieces art (to the left of the window) at auctions while stationed in the UK. I printed this cool photograph off of unsplash.com. It is entitled The Running of the Bulls. 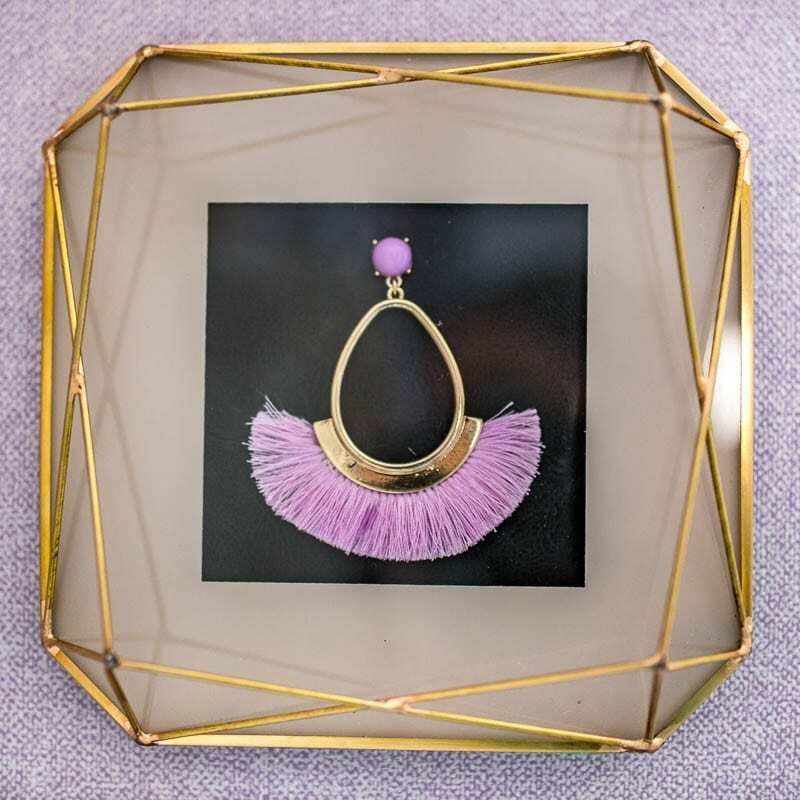 On this wall I hung more free photography printed off of unsplash.com and framed an earing from Target for an unexpected twist. These soap dispensers were on sale at Target this week. They match so well with the black elements of the room. You may have noticed thart I mixed my metals. 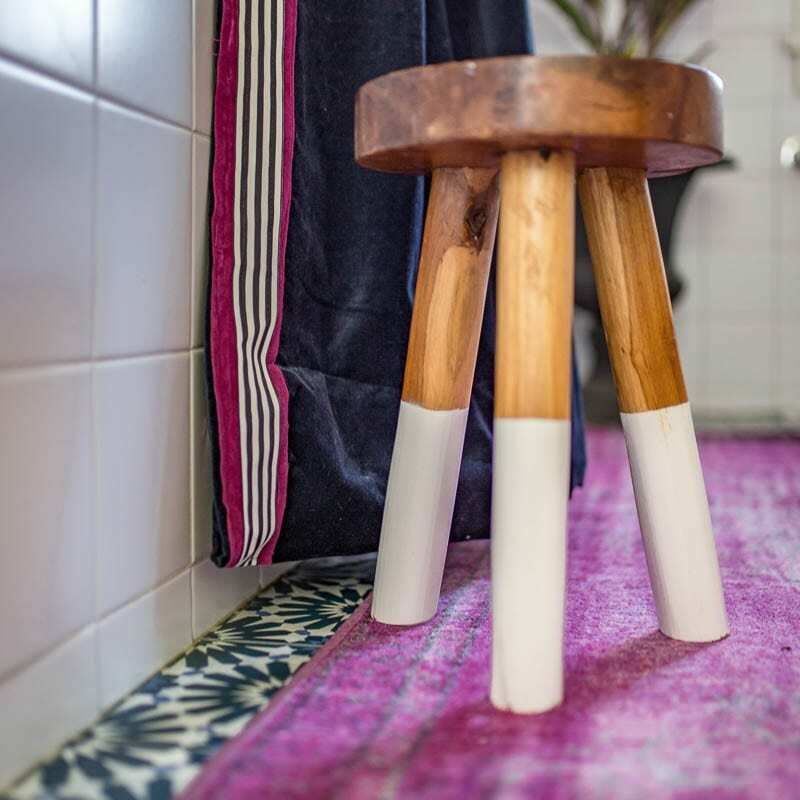 Luckily for me this a a current bathroom design trend. 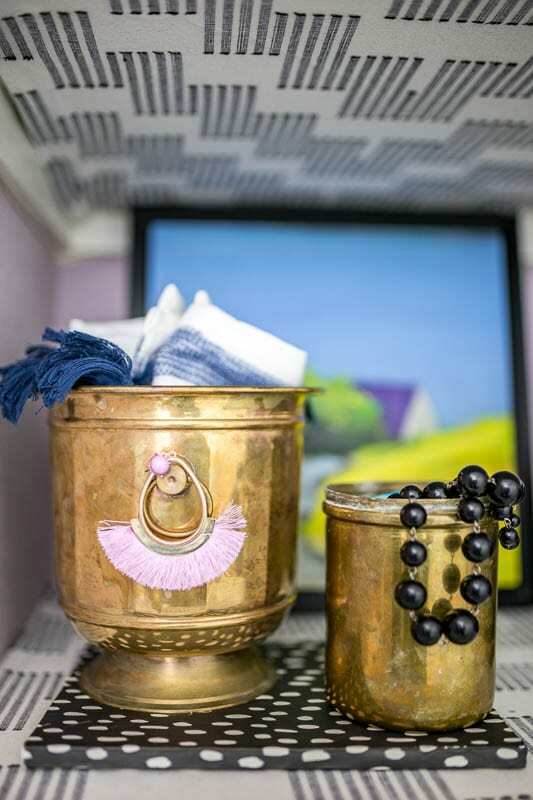 To make it work I kept the silver on the same plane (around counter or towel rack height). 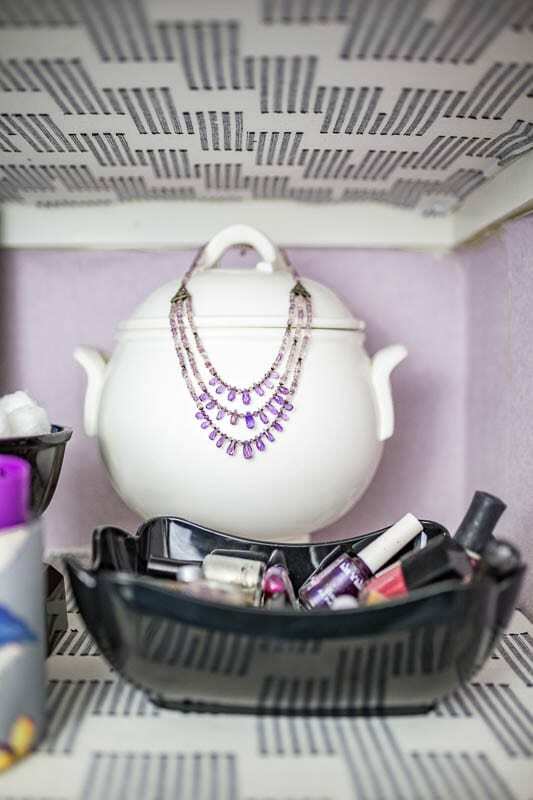 I purchased the pretty pottery at a thrift store, tied a velvet ribbon around it and decorated it with a pair of earrings…apparently earrings are my new favorite decorating accessory. 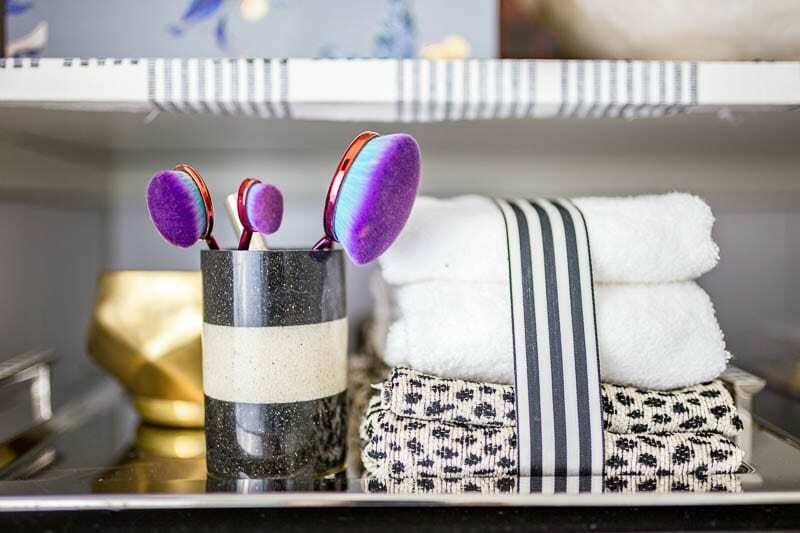 The pretty striped towels are actually dinner napkins from Target, but they totally do the trick (especially when I’m expecting company). 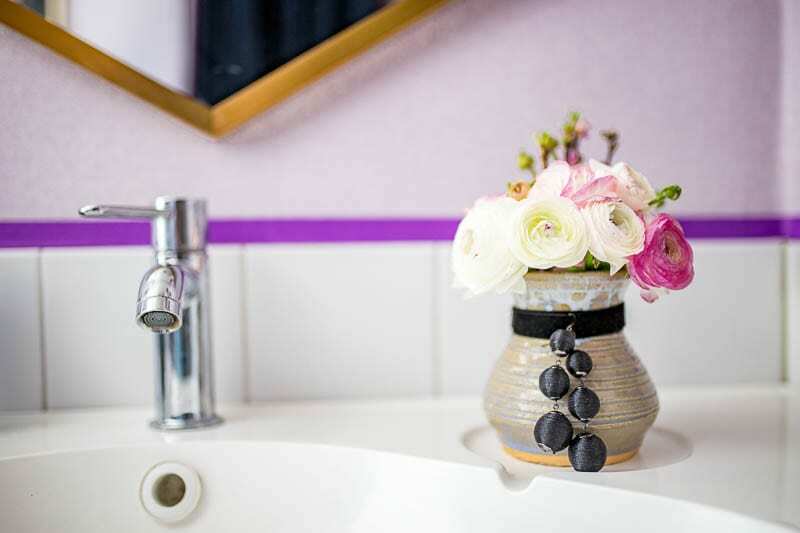 Next on the Blog Hop Stop is my second (and unexpectedly HOT PINK) bathroom. 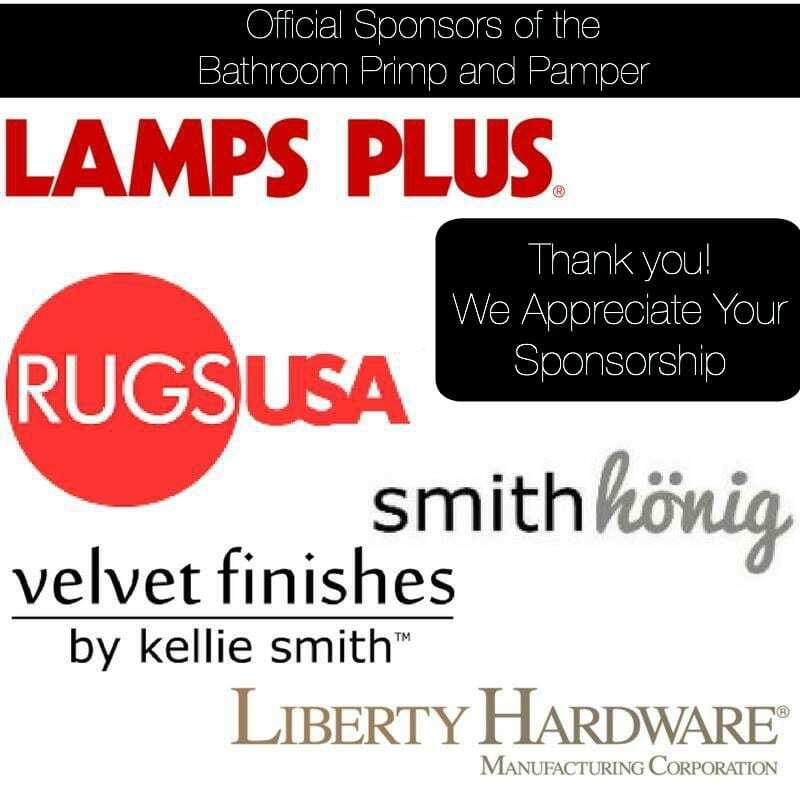 A HUGE THANK YOU goes out to each of our fabulous sponsors. 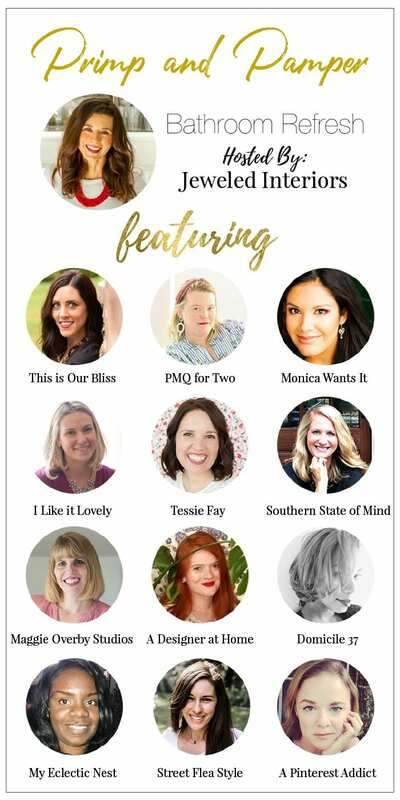 This blog hop would not have been nearly as wonderful without your support. Lol! THANKS MAGGIE! 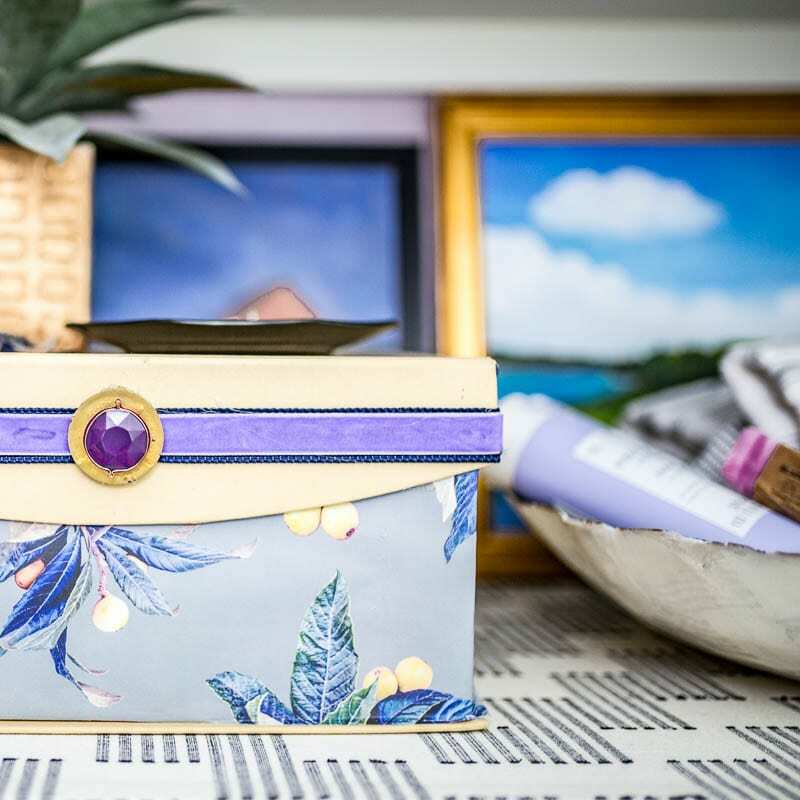 I wanted to name my website jewel box interiors but my military friends told me that was inappropriate. You already know this, but you’ve done a fabulous job here. The purple is so fresh, and very funky. 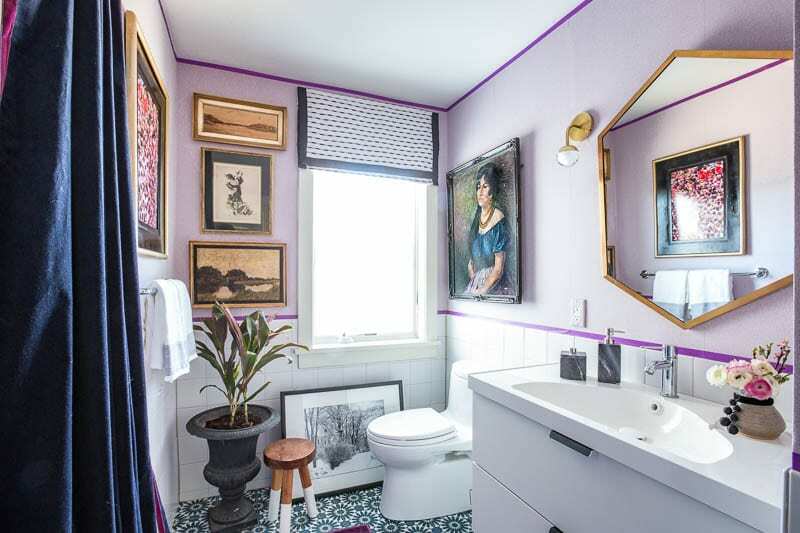 The painted trim gives it a little extra oopmh, and all those accessories and styling choices are spot on! Oh my gosh. Love it all. Love the purple. Love Carol and your suspicious Craigslist deal. It is SO full of personality. It’s fantastic. Jewel! Holy cow- there are so many amazing details! 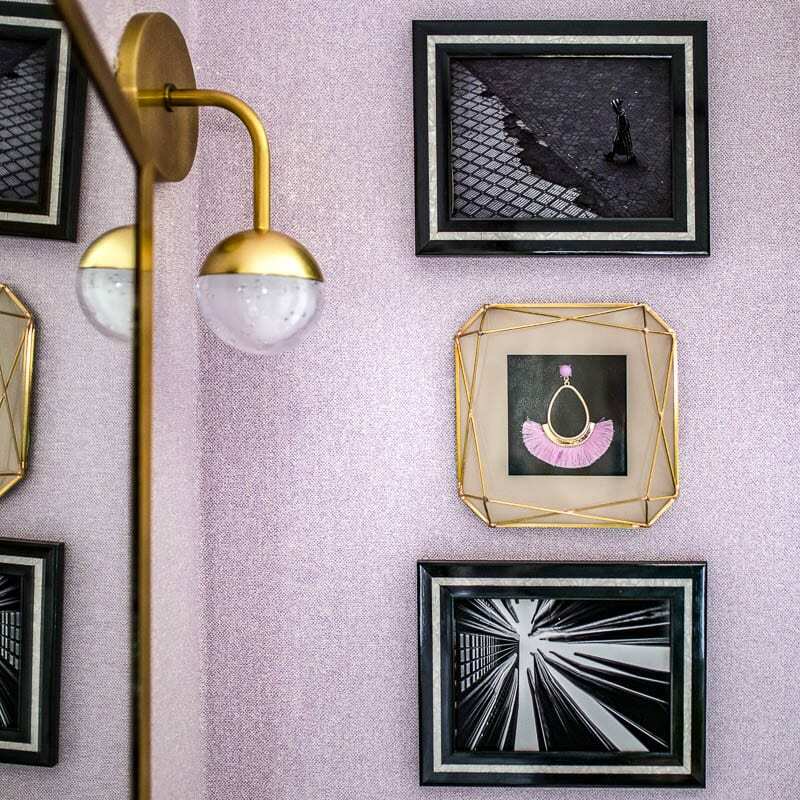 I love the walls, the gold mirror and sconces are incredible. Such amazing art!! This is perfection!! 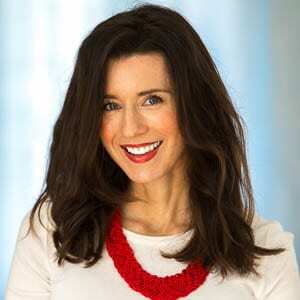 Thanks Heather! I appreciate it! I love that! #boldwithsoul Thanks Jess! Your ART!!! And those shelves still have me swooning since your previous post! I just love all of the different black and white patterns. You rocked this purple one and I can’t wait to head over to the pink one now! I love it all Jewel! 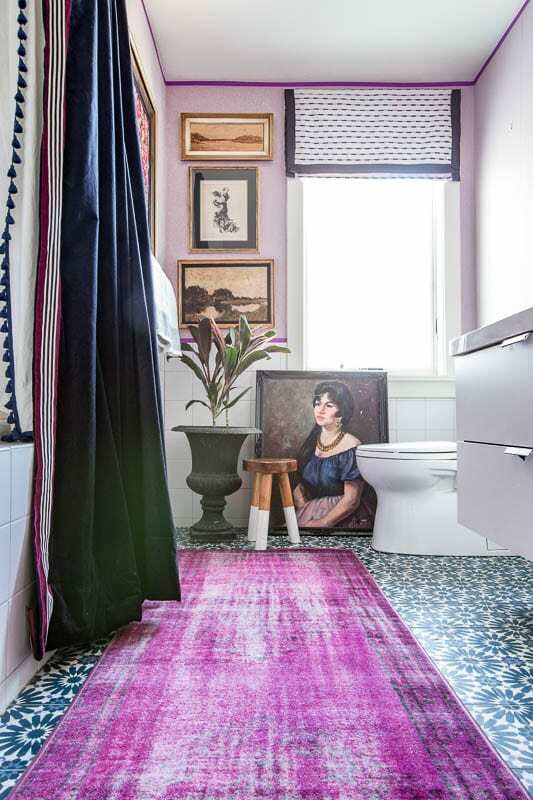 The art, the shower curtain…omg amazing! Whoa, whoa, whoa! All of this is SO fab. 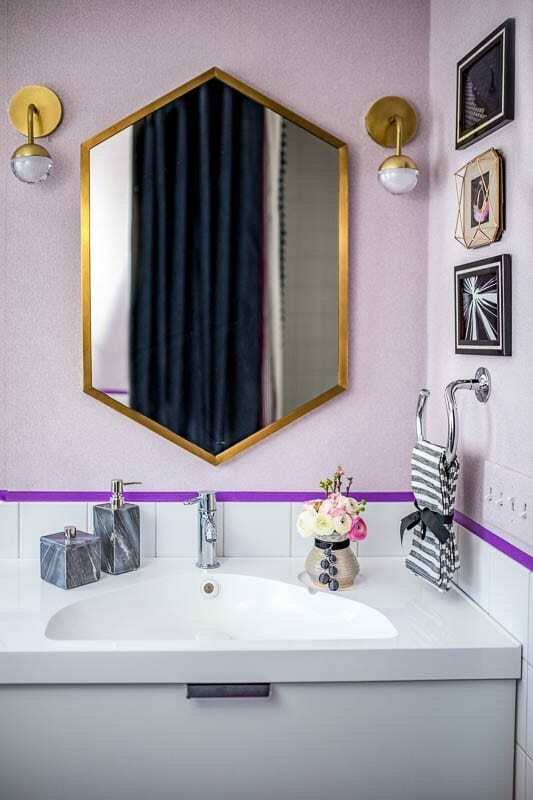 So many things to love but I must admit I love that layered shower curtain- the velvet, the ribbon, the tassels- its PERFECTION! i am not a purple person at all, but oh how i loooooove this makeover! looks amazing! 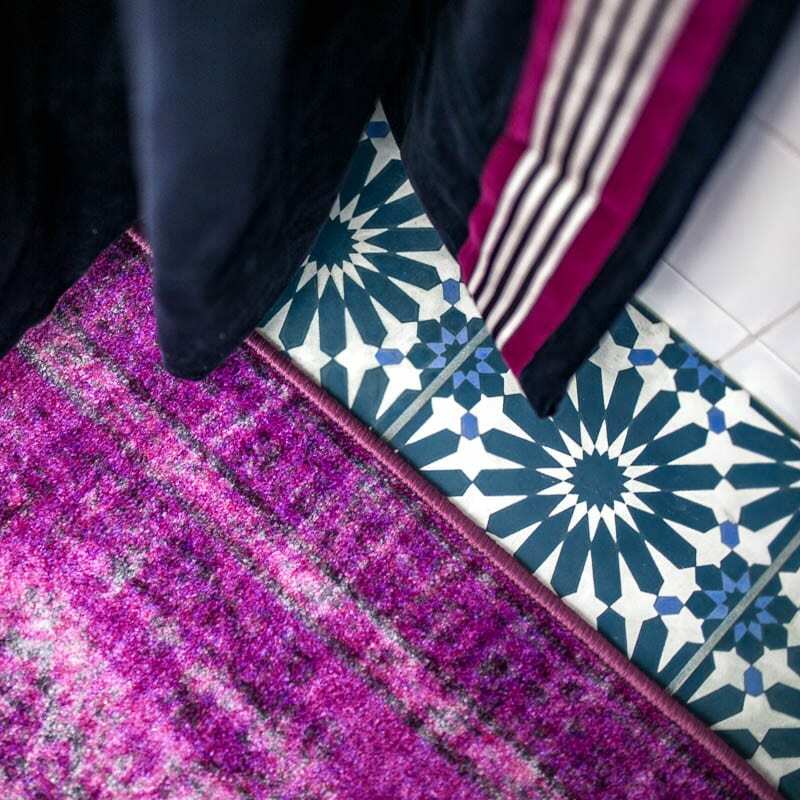 love those floors with that rug! Thanks Cassie! It was fun to tackle! Thanks Heather! I do love me some velvet. No worries! 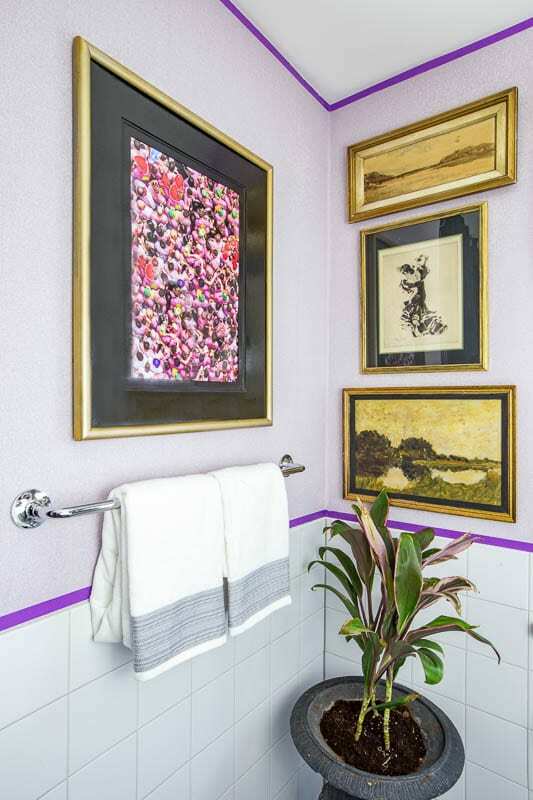 I absolutely LOVE your bathroom too! I can’t believe your raw talent! 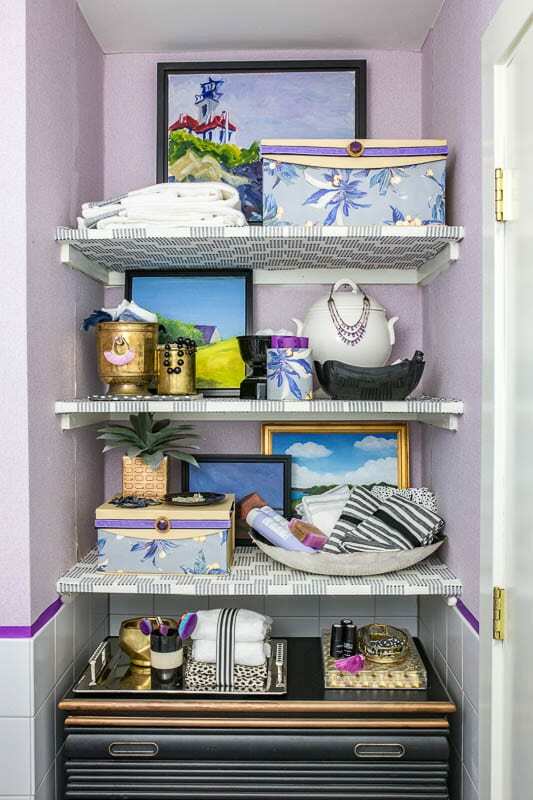 Wow those shelves were the real makeover! Love how beautiful they are after the organization. The art adds a really cool layer to the space. The mirror and sconces- those are spectacular!